Today in Masonic History Gordon Weaver Browning is born in 1889. Gordon Weaver Browning was an American politician and soldier. Browning was born on November 22nd, 1889 in Atwood, Tennessee. He graduated from Milan High School in 1908 and enrolled in Valparaiso University. He graduated with a Bachelor of Pedagogy (Education) in 1913. He briefly taught school before attending the Cumberland School of Law in Lebanon, Tennessee. He graduated in 1915 and shortly after was admitted to the bar. He started in private practice in a local law firm. In 1917, after the United States entered World War I, Browning enlisted in the Tennessee National Guard and fought with his unit in France where he was cited for gallantry. 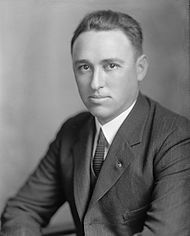 In 1920, Browning ran successfully for a seat in the United States House of Representatives. He served in the House of Representatives until 1935. He left the House to run for a vacant United States Senate seat and was defeated. In 1936, Browning turned his attention to the Governors office of Tennessee. He ran on the promise to clean up state government and was elected as Governor. He spent most of his time cleaning up excessive state debt. He unfortunately made an enemy of an important Political Boss, E. H. Crump, in the state by appointing some of Crump's enemies to positions in the state. In the next election, despite Browning's efforts to change voting laws that would have weakened Crump's power, Browning was defeated. When World War II started, Browning tried to get himself a commission in the Untied States Army. When local political appointments blocked his efforts he went straight to the United States Army adjutant general. During World War II, Browning was trained in putting together Military Governments to help transition areas previously held by Germany. He was deputy head of the Belgium-Luxembourg mission which was important during the Battle of Bulge. In 1946 he was appointed the commander of the military government of Bremen. While Browning was still in Bremen he ran again for Governor of Tennessee, although he was defeated, it was a close race with Browning never having been able to campaign. In 1948, Browning ran again and this time was victorious. In his second term Browning took steps to further weaken Crump who still wielded considerable power. He made a permanent voter registry and abolished the Poll Tax which was used by political bosses to control who could vote. In 1952, Browning lost the Governors office again. This time, Browning had difficulty adjusting to the new medium of television that his younger opponent embraced. Browning settled down in Huntigdon and practiced law. He did stay active in the Democratic party. He operated a dairy farm and an insurance company as well. Browning passed away on May 23rd, 1976. Browning was a member of Huntingdon Lodge No. 106 in Huntingdon, Tennessee. He was also a member of the Valley of Tennessee, Ancient Accepted Scottish Rite and Al Menah Shrine Temple.